Will my stenciled designs need to be sealed or protected? I would like to stencil my refrigerator, what paint is best to use? Can I use colored pencils instead of stencil paints, with your stencils? What brand of paints do you recommend? Which do you prefer, stencil cremes or liquid acrylic paints? Can I use stencil cremes on wood? Oil based paints seem to become brittle after years of wear. Will acrylic latex paint deteriorate like this? Can I use stencil cremes on fabric? How much paint will I need to complete my stenciling project? Can I use spray paint on your reuseable stencils? Most stencil paints available today have proven to be very washable and durable and under normal use do not need extra protection. However, if your stenciled designs are exposed to excess traffic, wear and tear (kitchens or children's rooms) or the outdoor elements, we recommend that you use a more durable paint such as Plaid's Durable Colors or DecoArt's Patio Paint for these areas. These brands are weatherproof and waterproof and have proven to be excellent choices for outdoor or high humidity, or high traffic areas and do not require a sealer. Enamels may be a good choice and typically dry to a hard, washable surface and are fairly glossy. If you've already stenciled using the normal craft acrylics or gels and worry about your work, we suggest you protect your stenciling with a waterbase urethane for exterior use available at any Wal-Mart or hardware store. Allow your stenciling to cure for several days, then apply the sealer/finish according to the manufacturer's instructions. I've had great success with applying the finish with a roller, although others prefer a paint brush. Your choice. We recommend Durable Colors by Plaid. Yes, you may use colored pencils. It would be time consuming compared to applying paint. Also, the shading and color variation effects produced with pencils is quite different than that of stencil paints. But if that is your preference, yes, certainly you can use pencils. There are so many good brands on the market; Plaid, DecoArt, Folk Art, Delta Ceramcoat and Apple Barrel. I feel comfortable using any of these brands and usually base my decision on specific colors available for my project and cost. Stencil cremes are a type of paint that has the consistency of lipstick or a solid shoe polish. You can stencil on walls, fabric, wood, metal and most surfaces with the stencil cremes and they clean up easily with soap and water. Each type of paint has it's advantages. 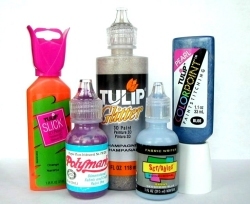 Liquid acrylics come in a wide variety of colors, are less expensive and they dry quickly. Stencil cremes are easier to blend, dry slower, and do not cause "drip" problems. I would say that it depends on your project. Yes you can. However, the color will not be as bold if the wood has been stained. Stencil cremes work best on unfinished or painted wood. Yes. You have two choices to do this. First would be to wash the surface then sand and then clean the sanding dust off. You then apply your latex paint over the oil based paint. That process works for both interior and exterior applications. Your other option is to wash the surface and then apply a coat of a bonding primer and then topcoat. No. The particles of acrylic latex paint fuse together to form a film that remains flexible over the life of the paint. This film has the ability to expand and contract with the surface, which helps give the paint superior durability. Absolutely. You will achieve a nice effect with cremes on most types of fabric. Simply make sure you prewash your fabric first. After stenciling, simply wait 2 weeks before the first washing. If you're unsure about the fabric you're using, simply do test the paint on a scrap of the fabric. There are two factors to consider when determining the quantity of paint you'll need, the design itself(how large the design is, and the number of colors required), as well as the distance from left to right that the design will need to fill. A good rule of thumb is that one jar of stencil creme, or one bottle of acrylic paint will stencil an average room. This estimate is per color. If you're unsure, two will definately suffice. A paint crayon is a solid stencil paint in crayon form. Yes. Just make sure to use light, sweeping coats of paint, so as not to overload the stencil, which would cause the paint to run under the stencil openings. To clean the stencil afterward, simply soak it in acetone and let dry.